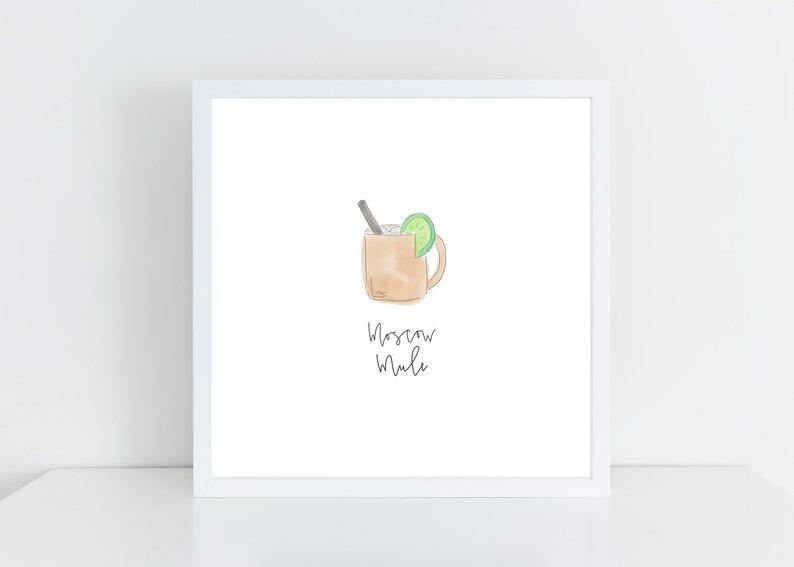 The first in a series of bar cart art prints, this moscow mule watercolor is a fun addition to your bar cart, home bar or dining room. This listing is for a 5x5, 5x7 and 8x10 downloadable version if this print. If you love this Moscow Mule watercolor print and would like a specific size or a hard copy print, send me a message, I'd be happy to help! Once you purchase, you will Esty will immediately send you a download link. Click the link and follow along to download and print! You will not receive a physical print, this listing is for download only and does not include the frame. The mockup of the print in the frame is for visualization purposes only. I also offer high quality prints of this piece here: https://www.etsy.com/listing/495018756/moscow-mule-watercolor-print-bar-cart.